Braids are a great hairstyle for the fall. It can be hard to keep curls in check once the wind sets in, and braiding is a great way to combat frizz while preserving your curls. There’s a braid for every occasion and every personal style. They’re also perfect for everything from intramural sports and second-day hair to date nights and fall weddings. The following braids tend to be best for type 2 hair, but other curlies can benefit from them as well! Try starting to braid when your hair is still damp for a little more control. If you’re looking for even more inspiration, look to the likes of Kerry Walsh and Misty Mae, Katniss Everdeen and other leading ladies of the red carpet for ideas! Is your curly hair layered? 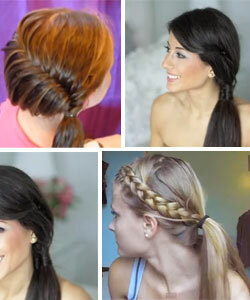 The French braid is great for incorporating and organizing all your different hair lengths. And if you have shorter hair, the French braid might work for you! 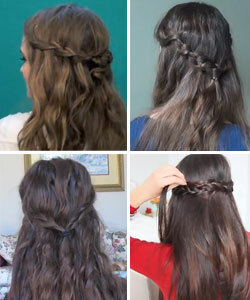 Because you start the braid near the crown of the head, not as much length is needed to complete it. Gather a small section of your hair near the crown of the head and begin braiding. As you approach the nape of your neck, gradually add more hair to each of the three sections as they cross into the center of the braid. This sleek, sophisticated braid will keep your hair out of your face all day. For variations on the classic, start with a side part or French braid a small section and leave the rest of your curls loose. It may look elaborate, but the fishtail braid is actually great for beginners! It’s great for long hair, especially on rushed, second-day hair mornings. Simply divide your hair into two sections, parting it down the middle. Pull a thin strand from the outside of one section and add it to the other, pulling it under the rest of the section. Continue to do this, switching between the two sections, until you reach the bottom of the braid. 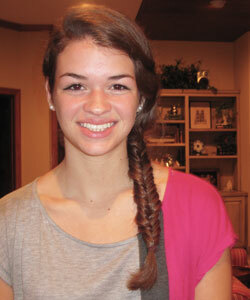 Using skinnier strands will make the fishtail braid look more intricate. To dress it up, find a few cute hair accessories or weave a thin ribbon into your braid. This is another great braid for curlies with short hair. Begin by pulling a small section of hair from above your ear. 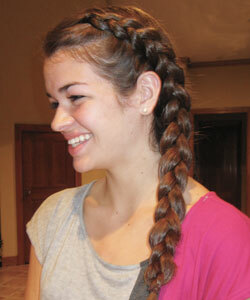 Then braid the section into an English braid. Do the same thing on the other side of your head, and pin the two braids together. Leave the rest of your hair loose and wavy. Start with a French braid and braid it until the nape of your neck. Secure the braid with a hair elastic and leave your ponytail loose. Slick your hair back into a tight ponytail. Then braid the ponytail into a fishtail braid, an English braid, or an Edwardian braid. Try a simple side braid and let it weave into your ponytail. I hope these braids provide you with a little inspiration!